All The Pretty Dresses: Late 18th Century Women's Riding Habit Jacket! 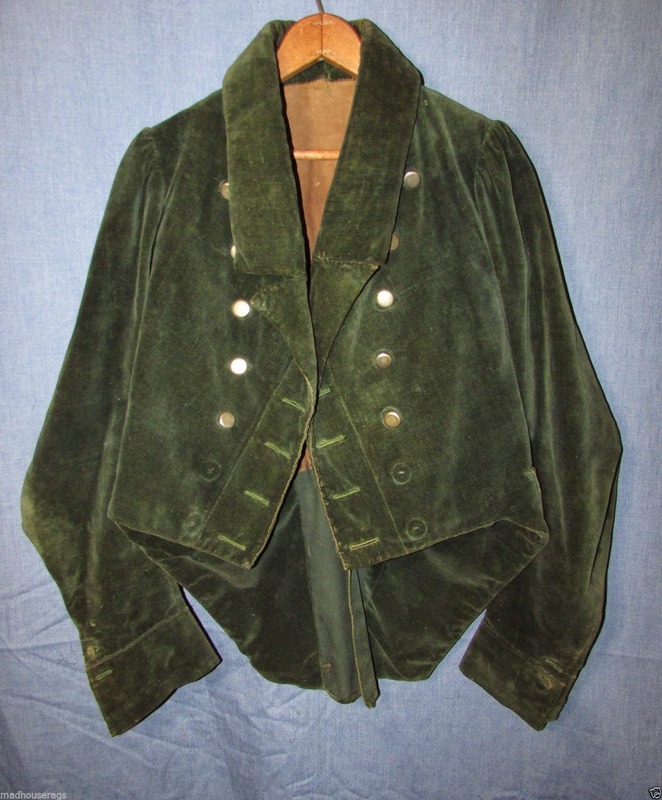 This is a rare velvet tailcoat from the early third of the 19th, or possibly the last decade of the 18th, century. 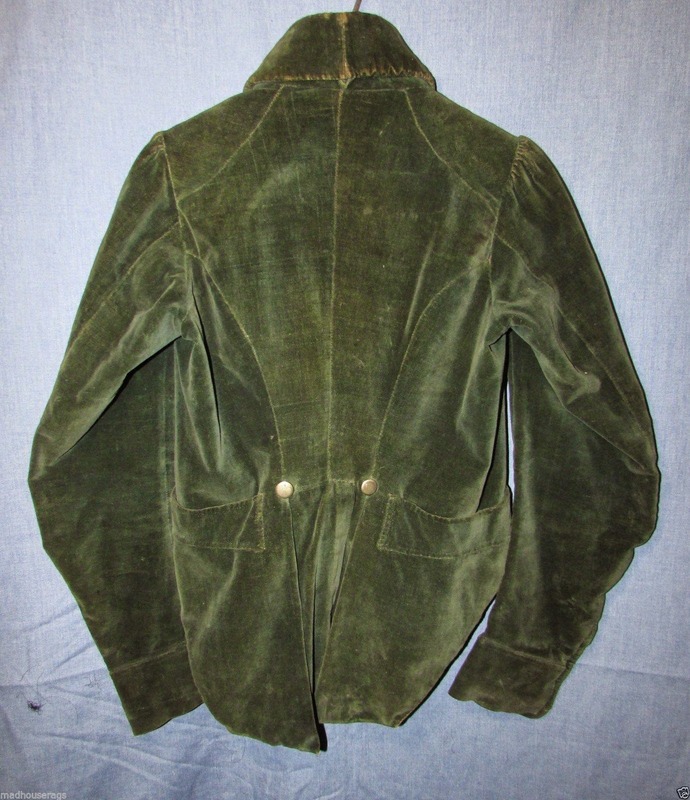 In a dark, moss green, it has a high collar, two pockets with a wide, shaped edge, short tails. There is no underarm seam, which dates it, approximately, to before 1820. 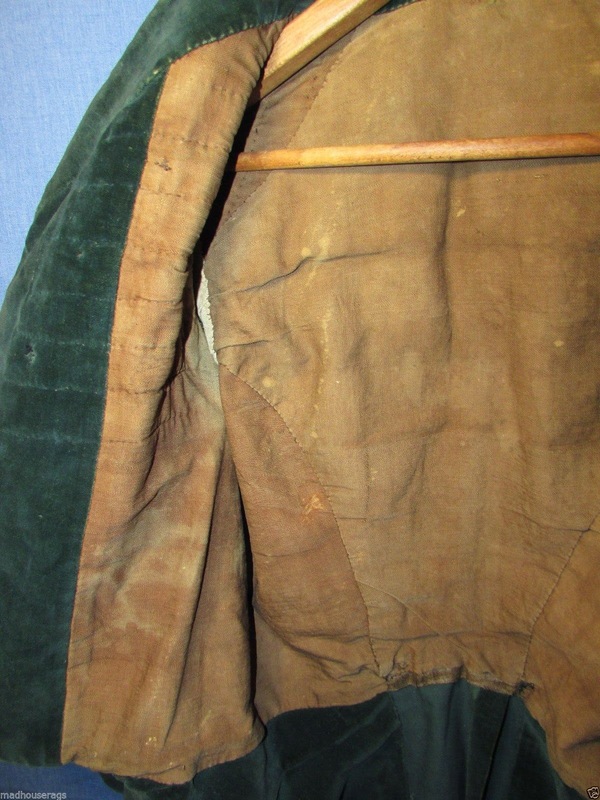 The present of the outside pockets could date it to before 1800. It's lined with a brown homespun type linen or heavy cotton, with a natural, tan lining the sleeves. There were fourteen steel buttons in front, ten remain. The wrists had two self fabric covered buttons each, one remains at each wrist. It's quilted at the collar, also at the inside chest to both the inside velvet and the lining, where there is a wide chest pocket. There is a loop to hang inside, which is broken off at one end. It measures 38" around at the chest, it's 13 12" between the shoulder seams in back, sleeve is 27 1/2", it's 27 3/4" long in back from the collar seam to the bottom of the tail. 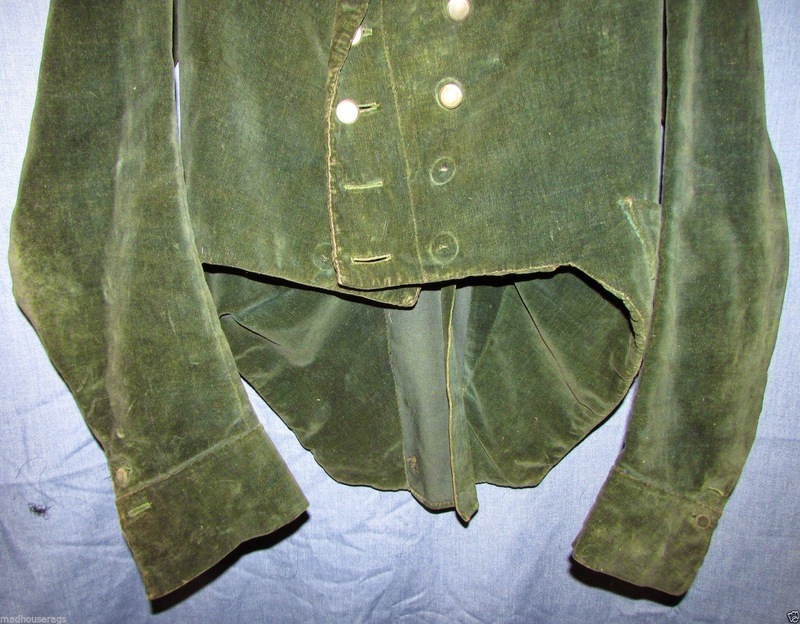 In good condition, with some wear, color loss to the velvet, around the edges, mostly, and at the elbows. As mentioned, four of the steel buttons at the chest, and one at each wrist, are missing. The lining has some discoloration, I don't see any holes or tears. 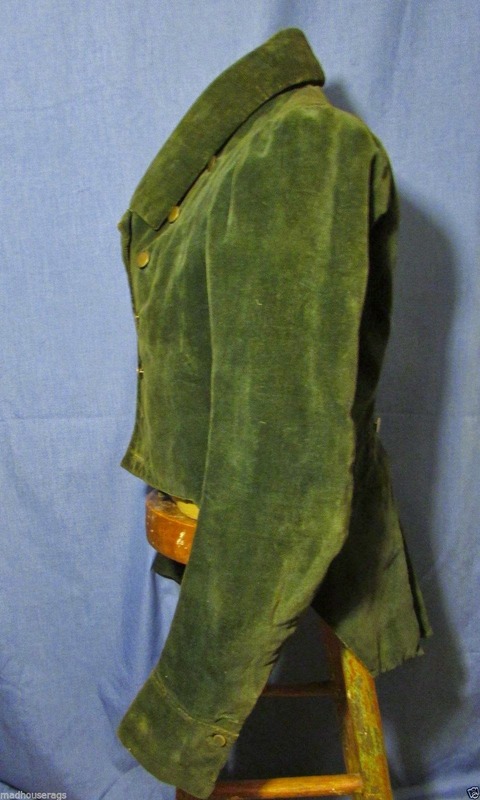 The dark, moss green shade is shown best in the pictures not on the mannequin, it's also a little darker than any of the pictures show, the lighting giving it some white spots and fading that is not present. The form does not look to have been altered. 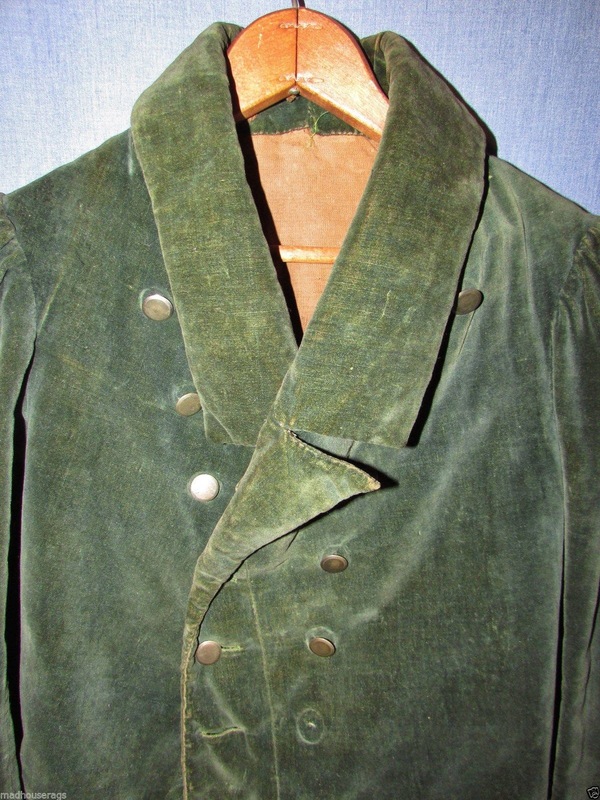 Nice to find an early coat with some late 18th century characteristics, and in color. Although you might think "Hey, it's a coat! That means it's a men's coat! ", that isn't true in this case. The easiest way to tell the difference between Men's coats of this time period and women's is by asking a simple question "Can you sit on those tails?". In this case, the tails are short and rounded - you probably wouldn't be able to sit on them easily- meaning they were for a women's outfit. Men's outfits of this same period and a bit later had tails that, generally, went almost to the back of the knee. 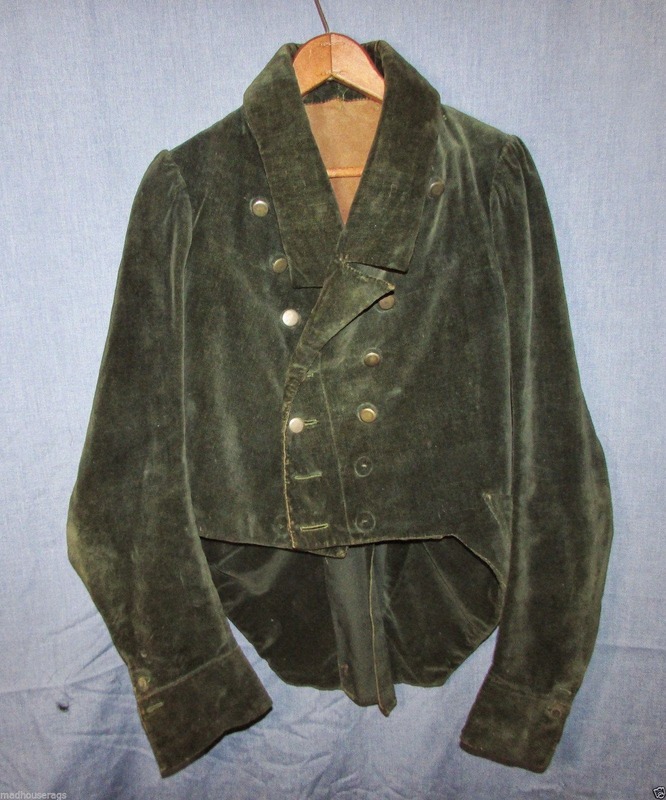 I'd definitely argue it's an 1820s mans jacket, possibly very late 1810s; shorter tails are commonly seen, especially in less formal attire (more jacket than coat). 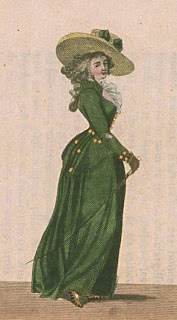 If it is a woman's garment it's from the late 1890s revival period. The sleeve head is far too full to date from late 18th century garments for women. 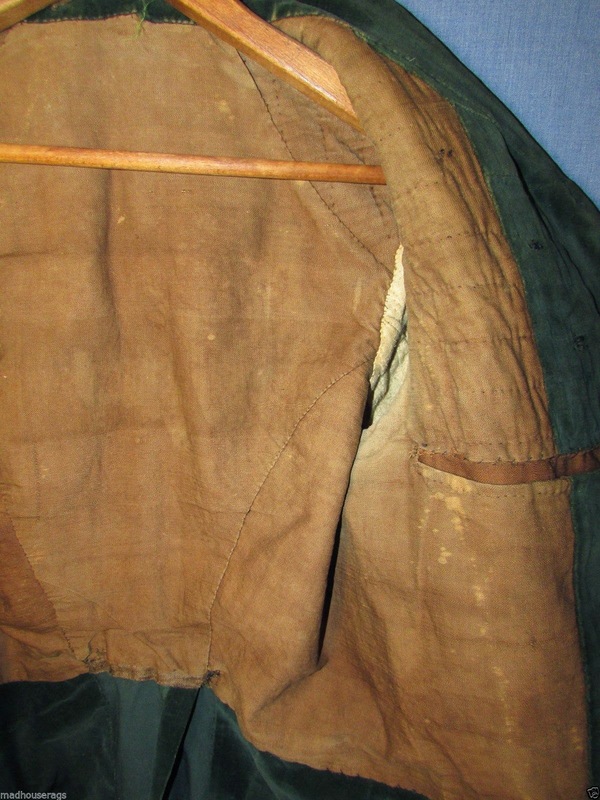 The waist seam and placement of the pocket flaps upon it also doesn't show up in men's wear until the 1810s and aren't seen on women's earlier riding jackets. The notch of the collar is also far to low to be pre-1815 and makes it more likely a man's 1820s jacket than a ladies 1890s as well. 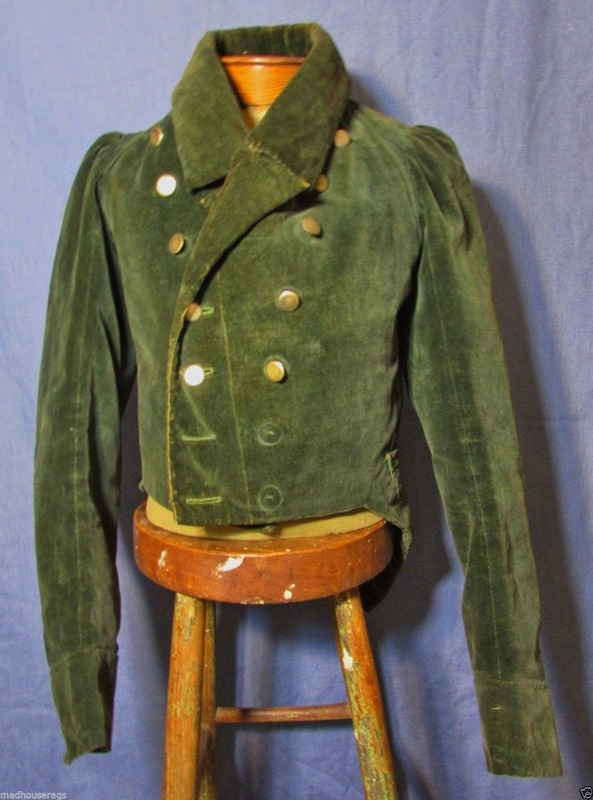 I was just looking at a 1790s ladies riding jacket in a private collection this week and it looks completely different in cut and style. I admit, I could be wrong. The part that gets me on this is the curved back. You just don't see it in any Men's jackets/coats of the period. They are straight in the back - like this. 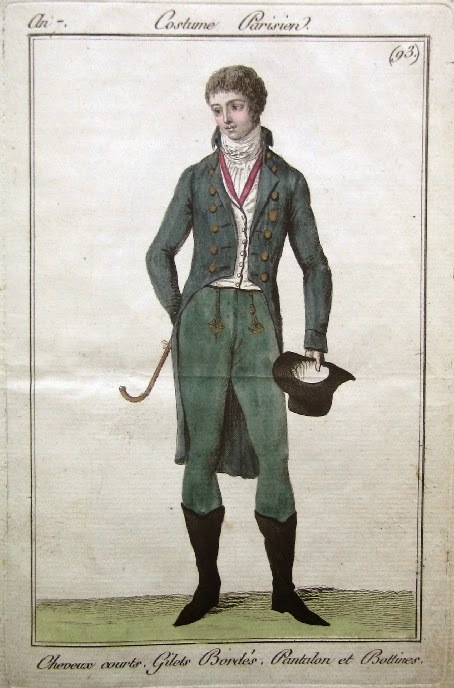 Another possibility is that it's a 1760's Riding Habit remade at a later date - which would also make sense. However, I doubt that one. 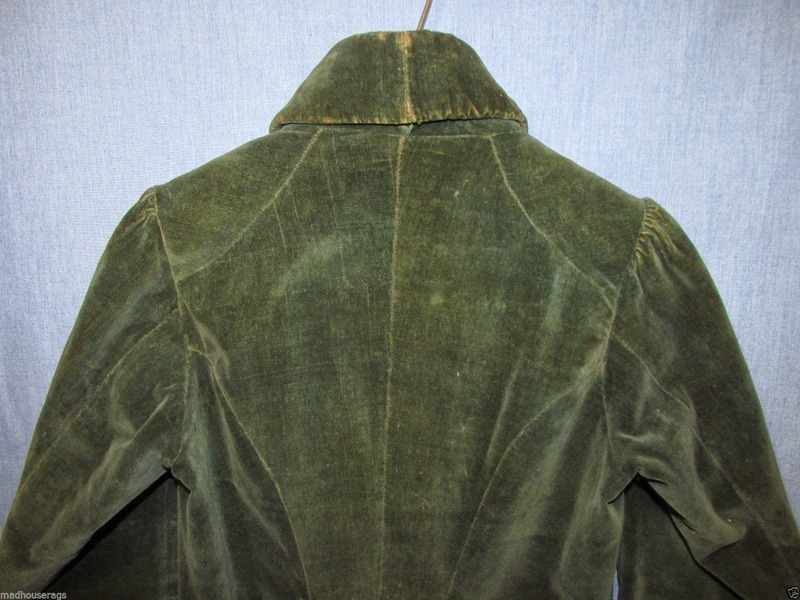 As for the pocket flaps placement - it's similar to what I've seen in other 18th C women's jackets. 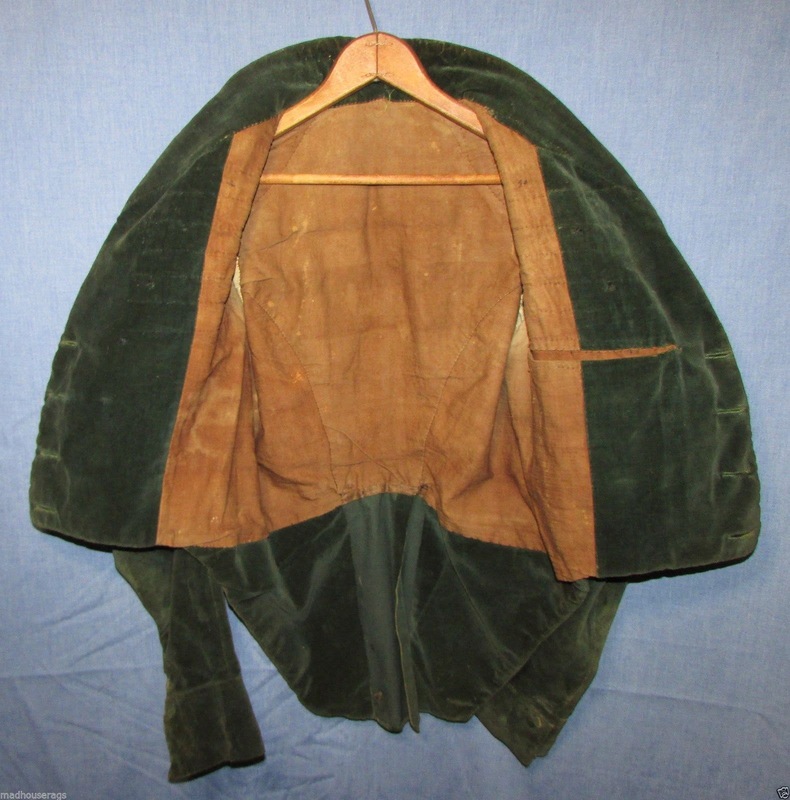 For instance this jacket has two pocket flaps. Here's a better picture I took when I got to see the jacket in person. Not the same shape, but the placement is in the back. 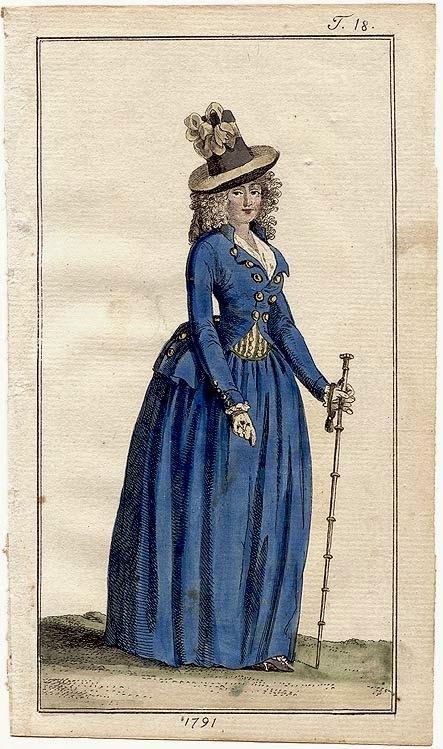 Pocket flaps do show up in 1720s women's jackets like that one, but I just can't see how the sleeve head could have been made larger, the skirts would be severely reduced in width but lengthened, the collar drastically lengthened, etc from an earlier style (it's also missing the horizontal bust dart). It looks a lot like this jacket to me, just shorter. A remade 1760's does make some sense when it comes to the larger sleeve head, the skirt length, ect. It's interesting to me that the quilting on the inside is only at the point where the bust dart traditional would be and up.